American family which derived its name from the town of its origin, Sulzbürg, near Ratisbon, in the Bavarian Palatinate. The first known member of the family is Eliezer Sussmann Sulzberger, born about the beginning of the seventeenth century. His great-grandson Ezra Judah Jacob Sulzberger was rabbi and shetadlan at Sulzbürg in the early part of the eighteenth century, and established there a charitable institution which still exists. He wrote an ethical will which is published in Dinard's "Or Me'i;ṙ" (pp. 45-52); he died in 1762. Of his descendants, some have taken the name of Bayersdorfer and others of Löwenmaier; one of the latter was cantor of Sulzbürg, and died in 1868. 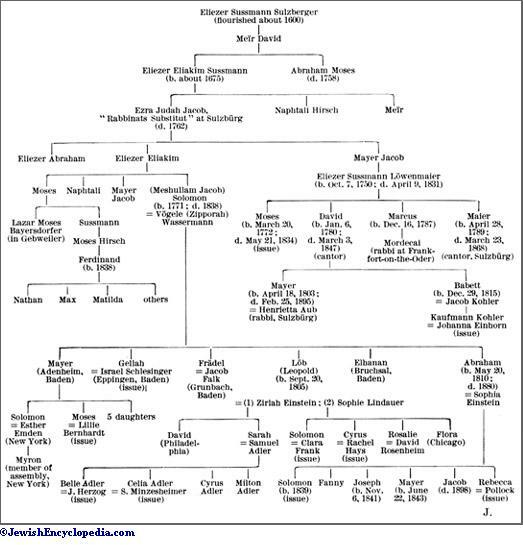 From a female member of this family is descended Dr. Kaufmann Kohler, president of the Hebrew Union College, Cincinnati, Ohio. Most of the descendants are established in various towns of Baden (Eppingen, Grunbach, Bruchsal), and four of the branches have emigrated to the United States. The eldest of these is represented by Ferdinand Sulzberger, head of the packing establishment of Schwarzschild & Sulzberger, New York. 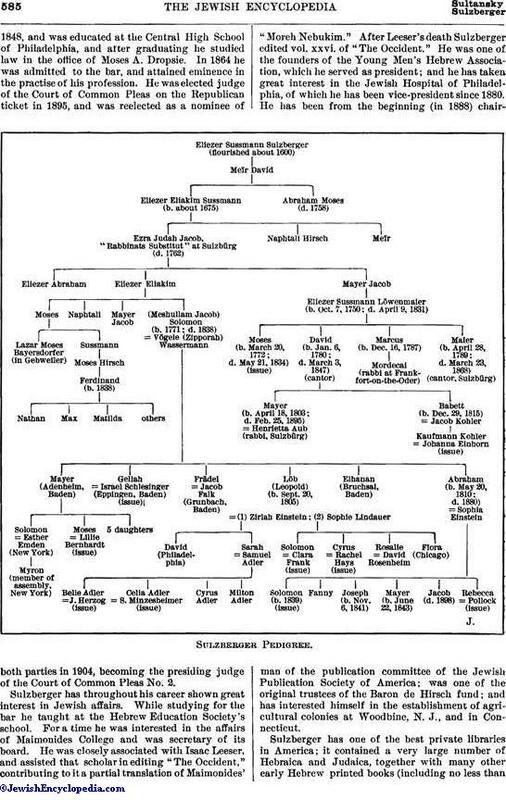 Of the descendants of Mayer Sulzberger who settled in New York may be mentioned Solomon Sulzberger, president of Temple Beth-El, New York, and treasurer of the I. O. B. B., and his son Myron Sulzberger, for a time member of the assembly of New York. 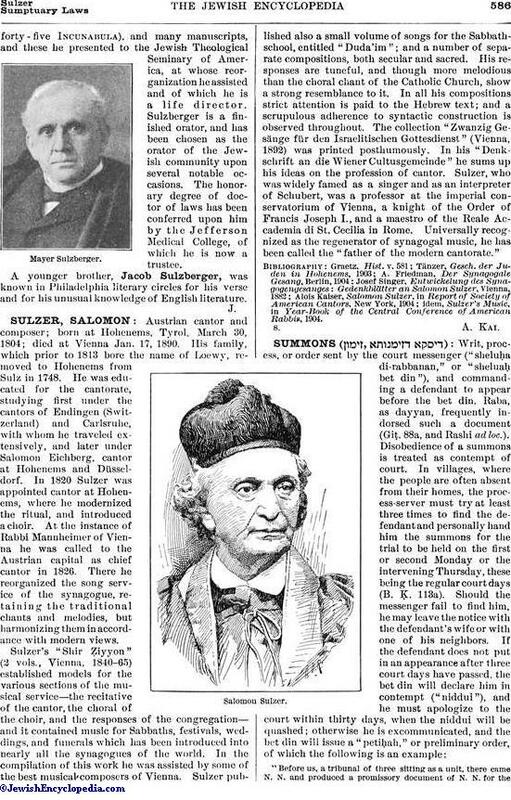 Leopold Sulzberger (d. 1881) emigrated to the United States in 1838 and was known in the Philadelphia community for his piety. 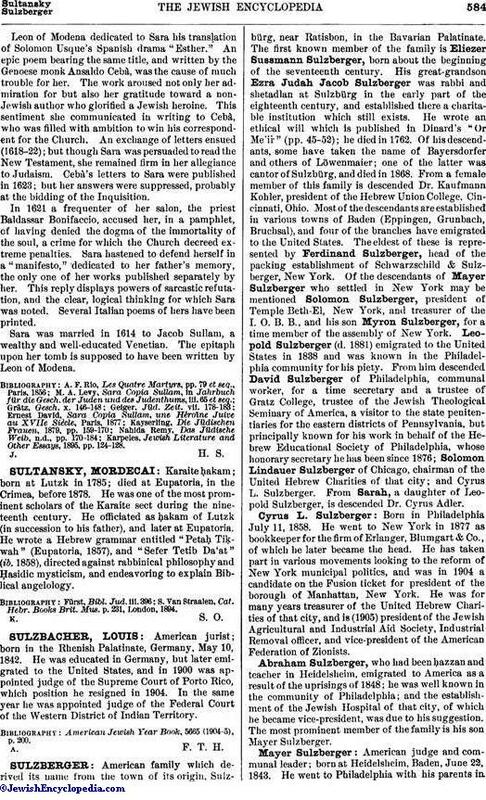 From him descended David Sulzberger of Philadelphia, communal worker, for a time secretary and a trustee of Gratz College, trustee of the Jewish Theological Seminary of America, a visitor to the state penitentiaries for the eastern districts of Pennsylvania, but principally known for his work in behalf of the Hebrew Educational Society of Philadelphia, whose honorary secretary he has been since 1876; Solomon Lindauer Sulzberger of Chicago, chairman of the United Hebrew Charities of that city; and Cyrus L. Sulzberger. From Sarah, a daughter of Leopold Sulzberger, is descended Dr. Cyrus Adler. Born in Philadelphia July 11, 1858. He went to New York in 1877 as bookkeeper for the firm of Erlanger, Blumgart & Co., of which he later became the head. He has taken part in various movements looking to the reform of New York municipal politics, and was in 1904 a candidate on the Fusion ticket for president of the borough of Manhattan, New York. He was for many years treasurer of the United Hebrew Charities of that city, and is (1905) president of the Jewish Agricultural and Industrial Aid Society, Industrial Removal officer, and vice-president of the American Federation of Zionists. Abraham Sulzberger, who had been ḥazzan and teacher in Heidelsheim, emigrated to America as a result of the uprisings of 1848; he was well known in the community of Philadelphia; and the establishment of the Jewish Hospital of that city, of which he became vice-president, was due to his suggestion. The most prominent member of the family is his son Mayer Sulzberger. American judge and communal leader; born at Heidelsheim, Baden, June 22, 1843. He went to Philadelphia with his parents in1848, and was educated at the Central High School of Philadelphia, and after graduating he studied law in the office of Moses A. Dropsie. In 1864 he was admitted to the bar, and attained eminence in the practise of his profession. He was elected judge of the Court of Common Pleas on the Republican ticket in 1895, and was reelected as a nominee of both parties in 1904, becoming the presiding judge of the Court of Common Pleas No. 2. Sulzberger has throughout his career shown great interest in Jewish affairs. While studying for the bar he taught at the Hebrew Education Society's school. For a time he was interested in the affairs of Maimonides College and was secretary of its board. He was closely associated with Isaac Leeser, and assisted that scholar in editing "The Occident," contributing to it a partial translation of Maimonides' "Morch Nebukim." After Leeser's death Sulzberger edited vol. xxvi. of "The Occident." He was one of the founders of the Young Men's Hebrew Association, which he served as president; and he has taken great interest in the Jewish Hospital of Philadelphia, of which he has been vice-president since 1880. He has been from the beginning (in 1888) chairman of the publication committee of the Jewish Publication Society of America; was one of the original trustees of the Baron de Hirsch fund; and has interested himself in the establishment of agricultural colonies at Woodbine, N. J., and in Connecticut. Sulzberger has one of the best private libraries in America; it contained a very large number of Hebraica and Judaica, together with many other early Hebrew printed books (including no less thanforty-five Incunabula), and many manuscripts, and these he presented to the Jewish Theological Seminary of America, at whose reorganization he assisted and of which he is a life director. Sulzberger is a finished orator, and has been chosen as the orator of the Jewish community upon several notable occasions. The honorary degree of doctor of laws has been conferred upon him by the Jefferson Medical College, of which he is now a trustee. A younger brother, Jacob Sulzberger, was known in Philadelphia literary circles for his verse and for his unusual knowledge of English literature.